Left to right in the photos above, Carolyn Biondi, Arm In Arm’s Executive Director, welcomed UWGMC’s Sandra Toussaint, President & CEO, and Tarry Truitt, Community Relations Director, for a tour and visit. 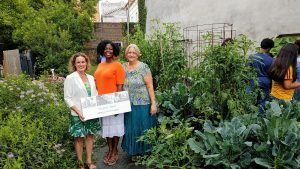 During the July 26 visit, Sandra presented our summer 2017 food purchase grant of $5,000. Many thanks to the United Way of Greater Mercer County for vital support as we join forces to Strike Out Summer Hunger in 2017! This support is so important — it helps to ensure that we keep our three busy pantries filled with a variety of foods for our customers – especially the children for whom the summer months away from school can mean an increase in hunger. 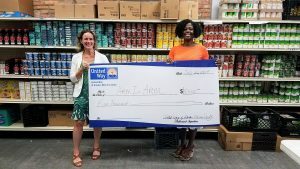 As part of Arm In Arm’s summer 2017 partnership with UWGMC, a team of our staff members pitched in with the Strike Out Hunger oatmeal packing event June 27! Heart healthy food is a hallmark of our pantries, and the oatmeal packets delivered to Arm In Arm as a result of that enormous community-wide effort were greatly appreciated by our customers and their families.